So the PopSugar Reading Challenge for 2016 is wrapping up. I was much less strict with my categories this time around, but the list itself definitely gave me some inspiration and kept me reading. 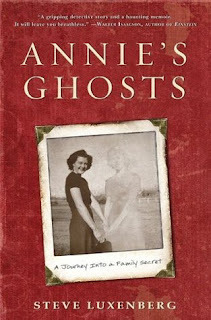 The 15th book I read this year was Annie's Ghosts: A Journey into a Family Secret by Steve Luxenberg. It didn't really fit in any of the categories I had left, so I just wrote it down as 'an autobiography,' when it was really more of a memoir or biography of sorts. In Annie's Ghosts, Steve Luxenberg and his family get a huge surprise shortly before his mother dies, and he begins to research what his mother has revealed after her death. While his mother, Beth (Cohen) Luxenberg always told people she was an only child, her family finds out she actually had a sister who lived with Beth and her parents until she was 21-years-old. The sister had a deformed leg, and mental issues. What led me to read this book was that it was somewhat local to me. The sister was a resident of Eloise for 31 years. Eloise was a huge institution for Wayne County, Michigan, that housed all sorts of residents over its lifetime. I found it fascinating to read the changing numbers of homeless, mentally ill, and others found to be wards during its existence. I liked reading about Michigan history in and around Eloise, the now-closed Northville Hospital, and where the family lived and knew people in Detroit. Since his family was Jewish, there was also history of Jewish migration out of Russia and into different popular US areas. While a non-fiction book can sometimes be dry reading, Luxenberg brought the members of his family to life in Annie's Ghosts, and I kept reading to see where everyone would end up, or where they came from. If this sounds interesting to you, and especially if you're local to these areas, I think you could really enjoy this book and learn more about the area and the people and times in it. This sounds like it could be interesting, I mostly read fiction but sometimes memoirs are good too. Annie's Ghosts sounds particularly interesting to me because of its ties to the Detroit area. The migration of Jewish people from Russia is another interesting aspect. I'll have to keep this book in mind for my 2017 reading list. I love non fiction! I'm adding this to my list of books to get from the library. Very cool it's local for me. Ooooo! I will have to add this to my reading list! I love a great memoir! Great post! Sounds like a good book. I'm not a big reader but I like the idea of a memoir. My daughter wanted to read this by looking at the cover alone! Like you it's always more engaging to read about someone who's local. Thanks for the review! I just passed the old Eloise the other day. I grew up in Westland so I was close. Sounds new and interesting. Might give this a shot soon!